Donna-Donny Truyens decided to put an end to his long and successful career. 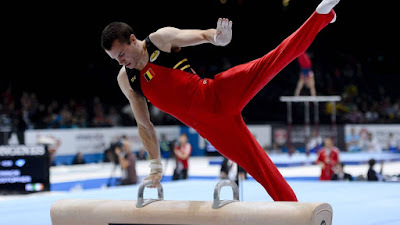 Born on March 31st 1989, he has been a member of the national team for 10 years and his favourite event was the pommel horse. He was, in fact, a true specialist on this event and has won multiple medals at international events. He made his debut with the Belgian team at the 2006 European Junior Championships in Volos (Greece). He ended up in 5th place in the pommel horse final. He became a Senior in 2007 and won a silver medal at the World Cup in Ostrava, in Czech Republic. He won his first major title in 2008, at the Szombathely World Cup, Hungary. The next year, he added three medals to his collection, two golds in Cottbus and Maribor and a bronze in Montreal. Despite very good results at World Cups events, he hasn't win a medal at a World or European Championships, even if he reached multiple finals: 2007 (EC Amsterdam, 5th), 2008, (EC Lausanne, 6th), 2009 (EC Milan, 6th), 2010 (WC Rotterdam, 7th), 2012 (EC Montpellier, 8th) and 2013 (EC Moscow, 6th). He was also a member of the national team that finished in 11th place at the 2014 European Championships in Sofia (Bulgaria). Truyens also competed in two Universiade, 2009 and 2011, and won silver on both events. Last year, he won a silver medal at the Cottbus World Challenge Cup. He was also part of the team which travelled to Glasgow for the World Championships where he was the alternate. Donna-Donny Truyens will remain one of the most successful Belgian gymnasts on the international stage. He was the first Belgian to reach a final at Euros and Worlds. Donna-Donny, thank you and good luck! Friendly meet BEL-GER-ROU: all you need to know!